land ark RV looks more like a high end ski lodge on wheels - GeekCast en Español..
land ark RV — a nomadic lifestyle brand on wheels — just released ‘drake.’ it sleeps up to six people, costs a little less than an airstream, can handle snow and is absolutely move-in-ready. the simply-shaped square and rectangular windows break up the sparse design like a cubist, picasso painting. its acute corners could cut the sky in half. these photos don’t show it, but you can imagine what this sharp black box might look like encased in a soft blanket of snow. 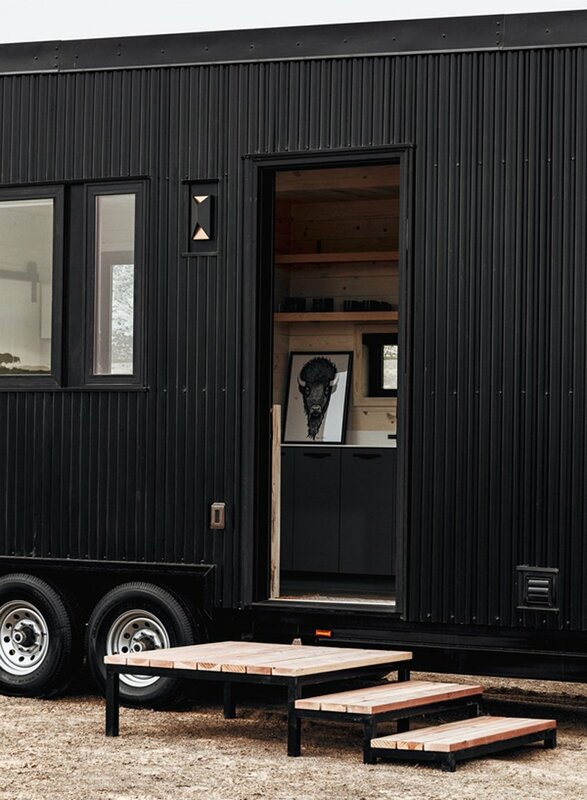 in addition to its high-end design and curated amenities, drake the land ark RV was designed by people who actually live the mobile tiny house lifestyle. since 2011, founders of land ark brian and joni buzarde have been ‘guinea pigs,’ experiencing and recording the positives and paint points. after these years of research, the two designed drake.